Well, I didn't make it to Neiman's last Thursday to meet Tory! I was so bummed, but work must come first so I can continue to wear TB. I read on The Home You Make that it was a great time and that Tory was very down to earth and wonderful to meet. They even had "Tory Burch Orange" treats! Today, I want to share my awesome purchase that I made a few weeks ago, while in Vegas. While the boys watched the Texans game, us girls had a shopping day that included a stop at Tory. We found a few lovelies that we couldn't live without including matching bracelets! Amanda purchased the Skinny Cuff with Logo Studs in silver metallic and I opted for the black with gold studs. 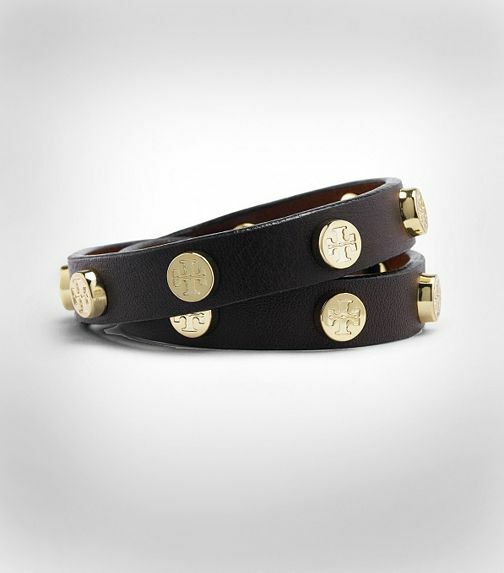 ﻿The bracelet also comes in brown and gold metallic on Toryburch.com. I found the same bracelet in black with black studs and cuoio with gold studs online at Nordstroms. These would look great stacked if you have multiples. At $95.00 this is a great way to get a Tory Burch accessory for under $100.00! Happy Shopping!